First I halve the peppers and remove the pit and seeds, then I sprinkle the interiors with salt, sugar, and cracked black pepper. Then I grill them on high heat briefly until they're somewhat tender and charred, about 5-10 minutes, before drizzling them with olive oil and red wine vinegar. I thinly slice onions in rings and grill them on high heat for 5-8 minutes until they develop a char and become slightly tender. Then I transfer them to a large skillet (on either the stovetop or grill) and caramelize them in olive oil with a drizzle of honey, pinch of salt, and cayenne pepper. Cook the rings over low heat until they're tender, about 25-30 minutes. I serve onions like this with steak, shrimp, and burgers, or even on a cauliflower steak. First I halve the eggplant lengthwise and arrange the halves flesh-side up on a baking sheet. Then I drizzle them with olive oil, then toss on some dried oregano, paprika, and salt. Roast them in the oven until tender and browned, about 15-30 minutes, depending on the size of the eggplant. Place the eggplant halves flesh-side down on the hot end of the grill and cook for an additional 5-10 minutes or until they develop a nice char. I like to finish them with a sprinkle of balsamic vinegar. This kind of eggplant preparation goes well with pasta and lamb and on pizza. My favorite way to prepare bitter radicchio is to quarter it and drizzle with olive oil and salt. 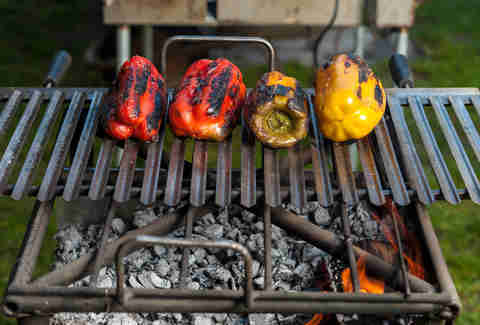 Grill 15-25 minutes, depending on the size, on the medium-hot part of the grill until it's tender. The grill will mellow out the flavor. Drizzle with a vinaigrette made of raspberry vinegar, olive oil, and a dollop of mustard. It's also nice to sprinkle a few raspberries over it for freshness. Zucchini needs a lot of salt! I split my zucchini lengthwise, then season it with salt and toasted curry powder. This spice mix will bring out the floral notes of the vegetable. Grill the zucchini on high heat until it's tender, about 10-15 minutes. 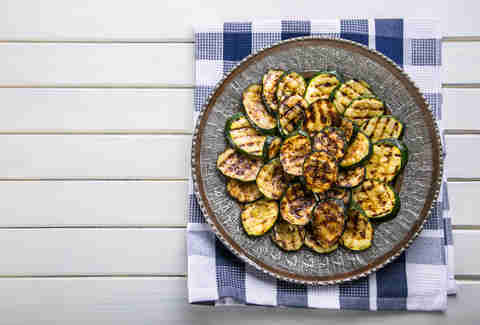 Sprinkle the halves with lemon juice and a drizzle of olive oil, then salt again -- salt will draw out some of the zucchini's natural water content. I typically serve zucchini as an entree, or I'll serve it as a side with grilled shrimp or chicken. I am a fan of old-school methods with corn. Bring a large pot of water to a rolling boil, then add a handful of salt and a handful of sugar. Add the shucked corn and cook for 10-12 minutes over medium heat. 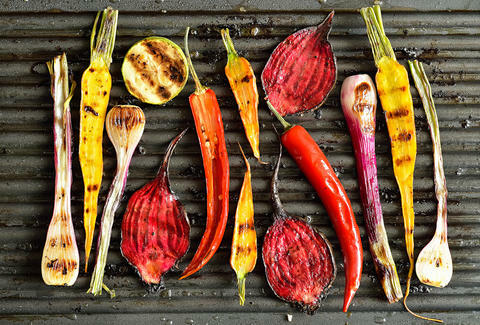 Remove the corn from the water and toss it on a hot grill to develop a char, rotating the ears so they char on all sides. This will take about 5-8 minutes. Toss the corn in melted butter with a generous pinch of salt, sugar, and Aleppo pepper. It's an excellent complement to a simple lobster or chicken dish. To make them how I do, place the potatoes -- whole -- on a 1-inch-thick bed of kosher salt on a baking sheet. Cook in a 425F oven until the potatoes are completely tender when pierced with the top of a knife, about 1 hour to 1 hour and 15 minutes. Remove the potatoes from the salt bed, split them lengthwise, and top with salted butter and smoked salt. A salt bed adds taste to potatoes and helps them toast up in a dry environment. I like to peel the stalks with a peeler before tossing them in olive oil, salt, and a pinch of cayenne. Then I arrange them on the medium-hot part of the grill in a single layer and cook for 3-5 minutes until they're slightly tender and browned. To finish, toast sesame seeds for 3-5 minutes in a thin layer on a baking sheet in a 350F oven until golden brown. Sprinkle the sesame over asparagus! Carrie Dennis is a former Food & Drink editor at Thrillist. Follow her on Twitter @CarrrieDennnis.